The 64-bit versions of Microsoft Windows Vista and Windows 7 let you run 32-bit as well as native 64-bit applications such as Cubase 6 or Cubase 6 x64. Thanks to the OS built-in compatibility layer that allows 32-bit software to run on 64-bit operating systems, all Steinberg 32-bit applications supporting 32-bit versions of Windows Vista and Windows 7 are supported on 64-bit operating systems as well. The difference is once again the amount of RAM available to applications. While a 32-bit application running on a 64-bit operating system can address up to 4 GB of RAM, (which is already twice as much as under a 32-bit version of Windows), a native 64-bit application such as Cubase 6 x64 supports a much larger RAM capacity. ::: Steinberg Media Technologies has released the Steinberg Elements Pack. Comprising Cubase Elements 6 and WaveLab Elements 7, the Steinberg Elements Pack provides all the essential tools that make recording, editing, mixing and mastering music on a PC and Mac computer "a rewarding experience". 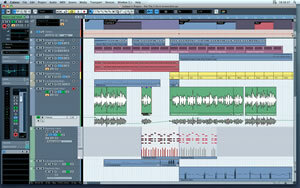 Steinberg releases Cubase Elements 6 trial version. Steinberg Media Technologies has announced the release of a fully functional Cubase Elements 6 trial version. - Users with a MySteinberg account now can evaluate the comprehensive feature set of the smallest Cubase retail version for a full 30 days, immediately available as download from the Steinberg website. :::: Cubase: Loading Synthphonica Strings VSTi and Selecting Presets. Microsoft Windows Vista and Windows 7/8/10 operating systems are available in two versions: the 32-bit and 64-bit edition. The main difference between these versions is the size of RAM that can be addressed by the operating system and applications. A 32-bit operating system like Microsoft Windows Vista allows you to run 32-bit applications only, while each application can address up to 2 GB of the available RAM. Generally, all Steinberg applications are available as a 32-bit binary and can be run with 32-bit versions of Microsoft Windows Vista and Windows 7. The 64-bit versions of Microsoft Windows Vista and Windows 7 let you run 32-bit as well as native 64-bit applications such as Cubase 6 or Cubase 6 x64. Thanks to the OS built-in compatibility layer that allows 32-bit software to run on 64-bit operating systems, all Steinberg 32-bit applications supporting 32-bit versions of Windows Vista and Windows 7 are supported on 64-bit operating systems as well. The difference is once again the amount of RAM available to applications. While a 32-bit application running on a 64-bit operating system can address up to 4 GB of RAM, (which is already twice as much as under a 32-bit version of Windows), a native 64-bit application such as Cubase 6 x64 supports a much larger RAM capacity. For many of its products, Steinberg already provides both 32-bit and 64-bit versions that are found on the same installer disc. This allows you to choose which version best fits your current requirements. Please note that if your installer includes the 32-bit version, but not the 64-bit version (such as Sequel), your product does support Microsoft Windows Vista 64-bit / Windows 7 64-bit versions but is not able to access more than 4 GB of RAM at a time. If a native x64 application is also included, the system requirements on the corresponding Steinberg product page mentions that a native x64 version is included. Please note that there are further differences between the 32-bit and 64-bit versions of Steinberg applications. For example, some components may currently not be available in 64-bit, such as QuickTime and Rewire. Generally, 64-bit VST hosts won't be able to run 32-bit VST plug-ins, but only native 64-bit VST plug-ins. However, Cubase 5 x64 can also support 32-bit VST plug-ins thanks to VST Bridge technology from Steinberg, which allows 32-bit VST plug-ins to run in a 64-bit host environment, Please note that compatibility issues may still occur owing to technical limitations in the bridging process. These limitations do not affect running 32-bit Steinberg host applications under Microsoft Windows Vista/Windows 7 64-bit versions and affect only native x64 host applications.